We are always looking for interesting pieces of furniture to pair with our blankets and cushions, so we were very pleased when Simon Pengelly agreed to lend us his beautiful Scapa chair for our latest shoot. You can see it in this detail below with our Northerly cushion. 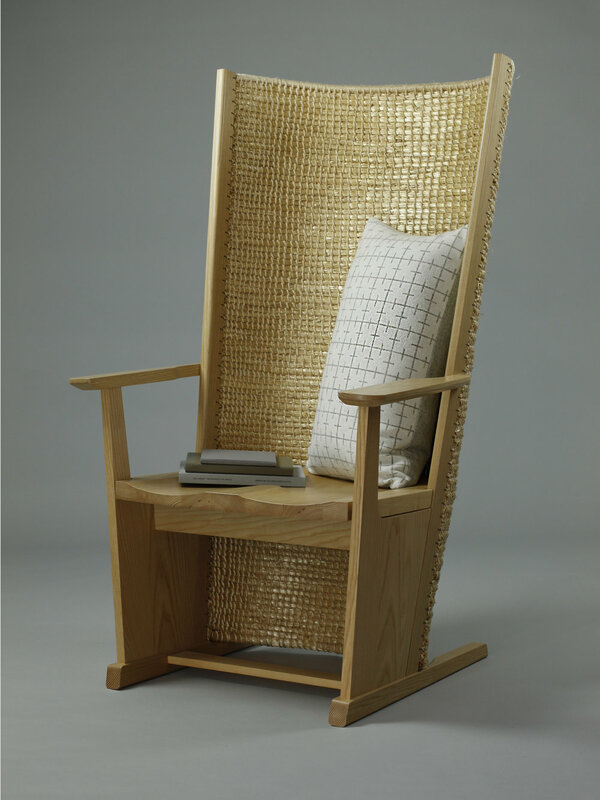 The Scapa chair is a wonderful piece, incorporating Simon's contemporary design and aesthetic, with many of the techniques and materials of a traditional Orkney chair - a wooden frame paired with a coiled back built up out of oat straw. It is an iconic piece deeply rooted in a very specific vernacular tradition. The materials used in the traditional Orkney chair were chosen for their local availability. 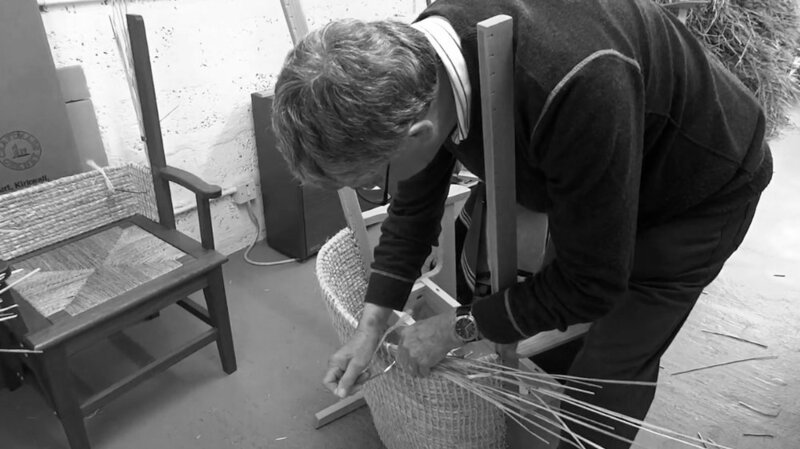 The high back of the chair is traditionally made from layres of oat straw, aligned in long bundles and stitched up layre by layre with seagrass to build up the height. 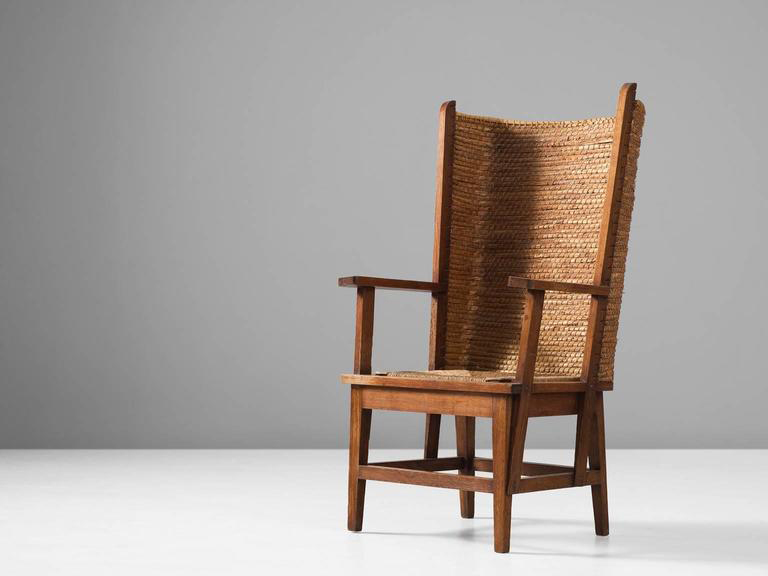 Oat straw was a readily available resource on these remote Scottish islands and was used for the high back of the chair in place of timber which was relatively scarce. You can see in the image above that the Orkney islands are virtually treeless, and historically the timer used in Orkney chairs was often driftwood or timber from ship-wrecks. As you can see in the image below, the combination of natural materials - oat straw, timber and sea grass lend the piece a wonderful tactile quality. The high, and sometimes semi-domed backs of the the traditional Orkney chair was built up to reach above head-height in order to shield the sitter from draughts which were prevelant in traditional Orcadian stone crofts. The oat straw is highly insulating and when placed to face the fire these chairs must have offered a cocoon of warmth and shelter from the Orkney winter winds. You can see a couple of examples of the traditional chairs below. The top image dates from the 1940's. The one below is a traditional domed one - there is a fine example of this style in the V&A dating from the 1890's. Indeed it was coming across the chair in the V&A furniture galleries which first sparked Simon's interest in this unique Orcadian tradition. Whilst the Scapa chair references the materials and techniques of a traditional Orkney chair, it has a number of unique elements. The oat straw backing, extends the full height of the chair, creating a wonderful curved wall of straw. Creating this subtle, flexible full-length expanding curve required a new approach to layering the straw, using a series of jigs and forms. You can read more about this unique process on Simon's website here. In addition, unlike traditional Orkney chairs, the timber seat of the Scapa chair is carved and moulded - referencing the adzed and pull shaved seat on a Windsor chair. The support struts on the Scapa chair are also thinner than usual, allowing for a degree of flexibility and movement in the back. Simon worked closely with Orkney chair-maker Jackie Miller in the construction of the Scapa chair. In the images below you can see Jackie building up the oat straw layre by layre. Jackie Miller and his wife Marlene are amongst a small number of craftsmen who continue to work in this unique tradition. ... we feel very lucky indeed to have had the opportunity to show our pieces with the Scapa chair. You can read much more about the Scapa chair on Simon's website here.